Dumpster diving is just one of the many methods that crooks use to find confidential information and wreak financial havoc. These dirty jobs are not only an easy way for identity thieves to find sensitive documents, but it is actually legal as well. Dumpster Diving: It’s Really Legal? Dumpster diving is formally defined as “examining waste product to find information that might be helpful to the attacker,” and in 1988 a Supreme Court ruling determined that what a person knowingly exposes to the public is not protected by the Fourth Amendments a result making dumpster diving legal. While the danger in opening the door for thieves to legally practice their trade seems obvious, the Supreme Court’s ruling makes dumpster diving a threat that everybody still has to consider and protect themselves from. Dumpster divers can find a wide range of information digging through trash, and while throwing out bills, bank statements and other records with identifying information is naturally danger to leave exposed, there are also more creative ways to take advantage. For just one example, a random sticky note with account passwords scribbled down for quick reference could give access to vast amounts of sensitive information. While financial and personal information can let thieves open accounts in your name or access your own accounts, there’s also been cases where technical specifications and documents were stolen, and while that might not let a dumpster diver steal from you directly, they can still sell proprietary information to competitors for a pretty penny. One of the most conventional strategies for protecting information from being easily stolen is shredding the paper before you toss. There are standard strip-cutters and also cross-cut shredders which cut the paper twice, but for a committed thief even then paper shreds can be reconstructed, leaving self-shredding to be a good protection but still not a surefire one. Since there’s still a chance for shreds of sensitive information to be stolen from a dumpster, absolute destruction takes another step further with additional steps beyond just cutting up paper into smaller pieces. In terms of completely destroying information, document shredding providers recycle their paper shreds so the ink is washed out and the paper broken down for other paper products. At the end of the day the sensitive information isn’t just more difficult to decipher, it’s gone entirely—leaving zero gaps in your security and removing the chance for a dumpster diver to get their hands on information. For small amounts of paper one of the easiest and cheapest ways to sidestep trashing your paper shreds it taking them to a drop off shredding location. Found in many nearby package and shipping stores, drop off shredding locations provide a cost per pound service where documents are stored in secure lock boxes before they’re shredded. As the paper accumulates trucks periodically top by to pick up the papers dropped off by customers and take them for shredding at a secure offsite facility, which is a far safer alternative to waiting for a dump truck to stop by an open dumpster. One of the more surefire ways to be sure your shredded documents are completely destroyed is mobile shredding since you’re able to witness the shredding yourself. With a mobile shredding service, shred trucks equipped with built-in shredders come directly to you, and like a dump truck you can watch from the curbside as the documents are lifted up into the shredder for destruction. 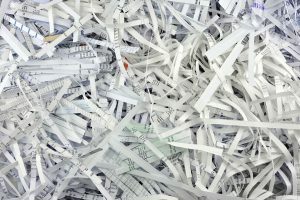 When the shredding is complete you’ve provided a certificate of destruction, detailing chain of custody, where and when the shredding took place, and other information—providing essentially a receipt of service. Offsite destruction entirely skips over the need to dispose what you shred because when you need to shred, a truck comes to your office or home, collecting your materials and taking them directly to a secure shredding facility. Once at offsite facilities, industrial shredders chew through yours and thousands of other sheets of paper per hour while you in turn are presented a certificate of destruction for extra assurance that the shredding was done according to industry standards. After the shredding is complete comes recycling as the final step, where the shreds are broken down, pulped, and eventually recycled and reused for new paper products, leaving your information gone without a trace. 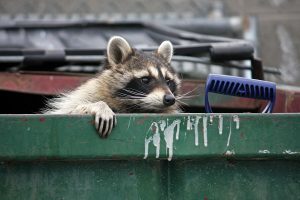 What’s Your Plan for Preventing Dumpster Diving? Dispose documents securely and affordably with shredding services that’ve been trusted by organizations including the American Cancer Society, Allstate Insurance, and Amazon when you use Shred Nations today.